St. Pete Free Clinic - Health Center Needs Your Help! 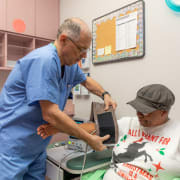 The St. Petersburg Free Clinic is in need of volunteers to assist at our Health Center that treats adults ages 18-64 without private insurance, Medicare, Medicaid, and who do not qualify by low income for county health care. Health Center Administration/Non-Clinical: Front Desk/Check-in, Intake, Medical Records, Patient Scheduling, and various admin projects. Patient Care/Clinical: RN's, ARNP, CNA's, Family Medicine Physicians, General Practice Physicians, Internal Medicine Physicians, Cardiologists, and other licensed healthcare professionals. You MUST be actively licensed in the state of Florida to volunteer in our Patient Care program. Health Educators: Professionals who are willing to educate our clients on various health-related topics such as; diabetes, cardiovascular, and other health & wellness opportunities. Volunteers are asked to commit to at least 3 months of volunteer service, ranging from a weekly to monthly commitment. Shifts are available on a weekly, 4-hour* shift, basis. If you're interested in learning more or signing up for our next weekly New Volunteer Orientation, please visit us online at https://stpetersburgfreeclinic.org/volunteer/ or contact our Volunteer & Outreach Coordinator at 727-821-1200 x 114 or volunteers@stpetersburgfreeclinic.org. *Please do not go to the Health Center location listed unless first speaking with the Volunteer & Outreach Coordinator. The Volunteer & Outreach Coordinator is located at our administrative offices at 863 3rd Avenue North, St. Petersburg, FL 33701. Clinical healthcare volunteers MUST be actively licensed in the state of Florida.